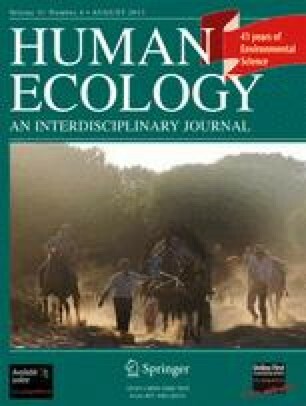 The Hutchinsonian concept of the ecological niche can be made operational for studies in human ecology by defining it in terms of thedistinctive ways of using resources for subsistence that set “cultural species” apart. Subsistence variety, the number of resources used for subsistence, and how much each is depended on are measures of distinctiveness, and the amount of variety present can be defined as thewidth of the ecological niche. The calculation of niche width from subsistence data is discussed, and examples are given from several human groups with reference to total resource variety, resource variety in space, and resource variety in time. The importance of selecting niche dimensions for niche width measurement is stressed, and examples are given of width differences resulting from measuring variety in quantity (biomass or calories) and variety in quality (protein, essential minerals, etc.). Finally, some implications of niche width measurements for human ecology are discussed.